The Volvo Amazon (although never officially called Amazon in the UK) came out in 1956 and, for its time, was a quality piece of kit. Replacing the PV544 and variants, the 120 range of Volvos soon established the Volvo reputation for solidity and it's concern for offering the car occupants a decent level of safety in the event of impacting something solid. Further models were introduced as time rolled by, and by the time production ended you could have chosen from 2 & 4 door saloons, and the amply-large estate versions, with a number of engine options featuring throughout production based on the same basic engine as lifted from the PV, and shared with the sporty P1800 range. The basic 121 model, introduced at the models launch in '57, came with a single Stromberg carb and was the bottom rung of the ladder of Amazon ownership through to 1967, early examples having the B16 1600 engine, later updated to 1800cc B18 spec. The 122S featured similar engines, but were warmed up a little with twin SUs, many featuring the desirable overdrive gearbox option to keep the revs down when cruising. The 2 door 123GT was available in the latter years of 120 production and was really the sportiest of all Amazons produced. The GT came with a perkier cam profile and some other refinements, not least a tacho bolted onto the top of the dash panel. 131 and 132 2 door variants of the standard model were also introduced around 1961, as were the 221 and 222 estate cars, which soldiered on until the 140 series replaced the 120 in 1970/1. Despite their renowned solidity, Amazons still rust and rust very well if left to their own devices, though Volvos shrewd use of heavy duty steel at least means that caught early, rot is often very localised. Some panels on the Amazon were galvanised, such as the sills on the 4 door models, the 2 door examples only having the forward section of sill so treated, the remaining section ahead of the rear wheel being part of the rear wing pressing and not so well protected. Front panels were also galvanised on some examples, though I'm not sure which cars were fortunate enough to benefit from this. Front wings rot in the usual old-car places, ie around the headlamps where mud builds up around the headlamp bowl. The front wings however do bolt on so can be easy swapped out for better examples. More of a problem however are the inner wings - all the cars I've had have featured grot in this area, and its important to not just look from under the bonnet, but also stick your head under the wheel arch and make sure that the box section is still there too, running along the level that the outers bolt through to. Iffy cars often feature welded on plates from within the engine bay to disguise rampant rot, so its essential to look from underneath too. With even the youngest Volvo 120s now over 30 years old, be sure to check all lower extremities as with any car - some examples also have rot setting in at the bottom corner of the windscreen, this is due to water getting past the screen seals and repairing this corner is a tricky, screen out, job. Doors can rust from the frame outwards, though they are rarely beyond recall. Sills have already been mentioned, and moving to the rear give the rear arches, and the separate fluted panel rear of the back wheels (plain on the station wagons btw) a good inspection. Boot lids can rust along their lower edge, often due to condensation build up on the inside of the panel, and, with the lid open, lift the bootmat and check out the rear lower panel, and joint where the rear inner arches curve around to join the boot floor. If things aren't too bad in these places, its time to have a poke around underneath. 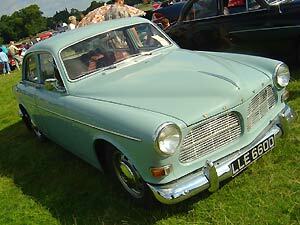 Volvos were undersealed from new and, by and large, it lasts well and does an excellent job. However once it starts cracking, moisture gets trapped behind it and hastens the onset of the creeping rot menace. The Amazon is of unitary construction, and assembled from top quality steel, however the undersides can suffer, especially in the outriggers and one I had was rusting on the central, longitudinal, chassis member, so its worth having a good look here too. Estates generally last as well as the saloons, although pay special attention to the rear split tailgate as these can get holed and finding replacements in good condition is not as easy as for the saloons. Fortunately many parts are still available new from Volvo even after all these years, although their prices reflect the low volume production that these parts are now in. Volvo 120s feature regularly in historic rally events even today, so this is a sign that once you have a good one, they still represent a superbly engineered route into classic car ownership, offering a standard of build that puts many contemporary classics well and truly in the shade. Generally speaking the engines are very resilient to hard use, and can soldier on for hundreds of thousands of miles before needing a rebuild. The earliest Amazons had a 1600cc engine, and some engine parts are now very hard to find, most owners now running later, visually very similar, 1800cc and 2000cc variants. Their only real weak spot is the fibre timing gears, which can wear and create a vocal rattle from the front of the engine. Steel replacement gears can be substituted, although they are a little noisier in use. B18 engines are quite a tuneable and revvy engine, the longer stroke B20 being more of a slogger but slightly less willing to rev. Performance mods have been available for Amazons since the 1960s, many of which were developed in the States, and owners today can choose from a number of performance tweaks to up the grunt from their solid Swede - straight through exhaust systems, tubular manifolds, perky cams, carb upgrades are all easily available, as are suspension and wheel conversions. Some Amazons have even been converted to the fuel injected B20 engine, as fitted to the later 140GL and P1800ES sports model. I often wondered if the 6 cylinder 164 engine would go in...? The Volvo transmission is pretty much bullet proof in normal use. The gearchange, via a long lever, has a well-engineered feel to it, which can lose some of its precise feeling if the brass selector on the top of the gearbox remote wears. Back axles can take some real hammer, but a high mileage car may begin to show signs of slop in the propshaft UJs, which can be replaced quite easily if needs be. Overdrive gearbox cars are worth hunting out, the o/d being operated by a lever on the steering column. The suspension is not a complex arrangment, and all parts can be bought new if wear develops, eg in the front balljoints. A regular thing to check is the condition of the fibre joint in the steering column, visible under the bonnet. This often suffers as it sits below the master cylinders and can get a drenching from careless topping up of the hydraulic fluid. It is easy to change this joint, and will improve the steering no end if there is any slop at the wheel. Coil springs are fitted front and rear, and are easy to swap, as are the telescopic dampers if they begin to leak. The earlier Amazons featured different seats and trim to later examples, and replacing damaged early trim with new is not an option, with secondhand items not being exactly thick on the ground either. All trim is hardwearing, although for some reason red seats on later style interiors, redesigned with good posture in mind, can fade badly. Floor mats wear out (no carpets were fitted as standard in UK cars) so have often been replaced, sometimes with carpet to make it feel snugger. Dashboard tops can split if regularly subjected to sunlight, the version on the 123GT being especially difficult to replace if damaged. Replacements can be sourced, but swapping them over is not a 5 minute job. Switchgear usually lasts well, as does the limited instrumentation. Headlining material rarely suffers, and it is quite possible to find a car with its original interior still in perfectly good order. One thing I've had problems with in the past, is the door winders. They run on a gear and chain mechanism, and its not unknown for chains to snap - replacements can be sourced secondhand though make sure you fit 2 door chains to 2 door cars, as the chains differ in length on 2 & 4 door models if I remember right. Getting to the chains inside the door is a little bit of a fiddle, not least because to get the door trims off, you have to pop out a pair of very awkward pins before the winder & door handles can be pulled off the door. Horn rings varied throughout production, the earlier cars having a large chrome ring that can snap if you are too energetic when using the horn, later cars fitted with uglier steering wheels don't have this problem. Exterior trim is usually pretty resilient, chrome bumpers can pit and go to look manky as on any car - new ones are available still but at eye-watering prices, so best bet is to rechrome straight but faded originals if you have any. The strips down the side of the car are stainless steel and only suffer if subjected to other people opening their doors on to your cars' flanks. Front grilles (and indeed the front panel) varied over the years, so read up one of the recommended books below to make sure your car has the correct items, as new replacments are thin on the ground. Hubcaps too are stainless, and are very sturdy. Original full diamets rimbellishers were available from Volvo when the cars were new, these are now hard to find in good order but really look good when fitted. As already touched upon, many new parts including body parts are still available new from Volvo and specialist suppliers, however interior trim, especially for early style trimmed cars, cannot be found new unless you are very lucky. Earlier cars also came with larger chrome hubcaps, with red centres, and a larger boot handle/trim, all of which are hard to find new. 1600 engine parts can be hard to track down, as can the rare 5.5J wider steel wheels that were available as an option during the 1960s. Secondhand panels can usually be sourced after a few phonecalls to specialists, and pretty much all mechanical items can be tracked down without too much headscratching, the car featuring many components from familiar companies such as Girling and SU for example. A solid but scruffy MOT'd car should be available upto UKP1750, and a little more for an estate, with good cars (especially GTs) climbing over UKP3500-4000, with very tidy cars heading higher. Basket cases and spares donors should still be available for UKP400-500 or so, simply because bringing a very bad example upto perfect order can be a wallet-lightening experience, as with most cars. Before venturing out to choose a Volvo 120, I'd recommend that you read up on the exact model that best suits your needs - have a look at the various Volvo titles that Amazon (!) has in stock, see the ad part way up this page on the right. .
Who should buy one, and who should not? 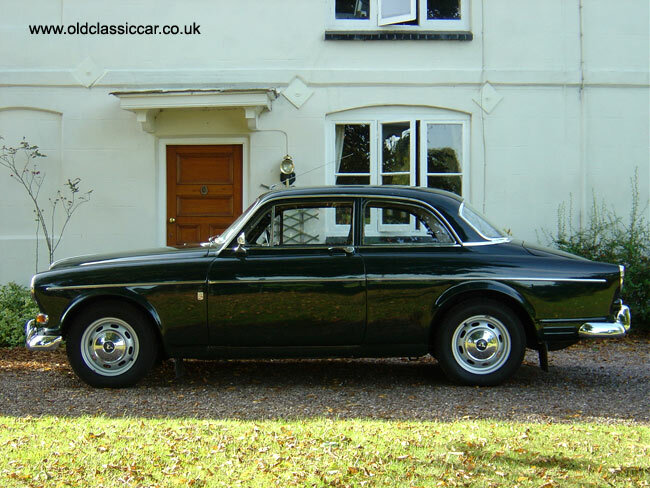 If you want a charismatic 4 seater old car to use every day, then go rallying with at weekends, for which most spares can be ordered over the phone, you cannot really do better than the Volvo Amazon range. I've had 6 or 7 in varying conditions and I think they are great cars. If you want an economical little runaround however, and fuel economy is your main interest, then the ~25mpg or so Amazon may not be for you, especially if you are slight-of-frame as the Amazon steering, and un-servo'd brakes on some models, can be tiring after a while. Over 667,000 examples were built, and there are still plenty out there to choose from if you can be patient and wait for a good example to come along. Free Volvo 121/122S/221 screensaver here at oldclassiccar!